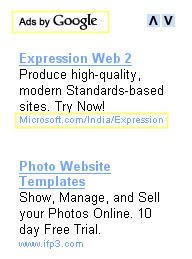 I was browsing a website today and it was interesting to see a Microsoft Ad come on Google Ads. Amidst all the battles that are being fought, it does look like Microsoft does needs Google's extensive ad network to popularize their products. Even Google buys ad links from Microsoft, Yahoo and vice versa. They need each other's support to reach more people.